The focus of this paper is to explore the use of kernel combinations of the support vector machines (SVMs) for vehicle classification. Being the primary component of the SVM, the kernel functions are responsible for the pattern analysis of the vehicle dataset and to bridge its linear and non-linear features. However, the choice of the type of kernel functions has characteristics and limitations that are highly dependent on the parameters. Thus, in order to overcome these limitations, a method of compounding kernel function for vehicle classification is hereby introduced and discussed. 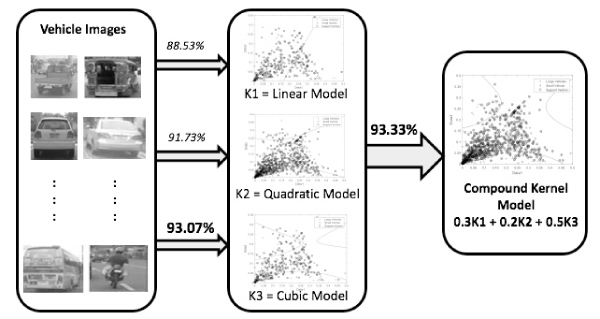 The vehicle classification accuracy of the compound kernel function presented is then compared to the accuracies of the conventional classifications obtained from the four commonly used individual kernel functions (linear, quadratic, cubic, and Gaussian functions). This study provides the following contributions: (1) The classification method is able to determine the rank in terms of accuracies of the four individual kernel functions; (2) The method is able to combine the top three individual kernel functions; and (3) The best combination of the compound kernel functions can be determined. E. Roxas, R. Vicerra, L. Lim, E. Dadios, and A. Bandala, “SVM Compound Kernel Functions for Vehicle Target Classification,” J. Adv. Comput. Intell. Intell. Inform., Vol.22, No.5, pp. 654-659, 2018. S. Sivaraman and M. M. Trivedi, “Looking at Vehicles on the Road: A Survey of Vision-Based Vehicle Detection, Tracking, and Behavior Analysis,” IEEE Trans. on Intelligent Transportation Systems, Vol.14, No.4, pp. 1773-1795, 2013. A. R. F. Quiros, R. A. Bedruz, A. C. Uy, A. Abad, A. Bandala, and E. P. Dadios, “Machine vision of traffic state estimation using fuzzy logic,” 2016 IEEE Region 10 Conf. (TENCON), 2016. A. C. P. Uy, A. R. F. Quiros, R. A. Bedruz, A. Abad, A. Bandala, E. Sybingco, and E. P. Dadios, “Automated traffic violation apprehension system using genetic algorithm and artificial neural network,” 2016 IEEE Region 10 Conf. (TENCON), 2016. A. Nag, D. J. Miller, A. P. Brown, and K. J. Sullivan, “Combined Generative-Discriminative Learning for Object Recognition using Local Image Descriptors,” IEEE Workshop on Machine Learning for Signal Processing, 2007. B. Benfold and I. Reid, “Stable Multi-Target Tracking in Real-Time Surveillance Video,” IEEE Conf. on Computer Vision and Pattern Recognition (CVPR), 2011. D. C. de Oliveira and M. A. Wehrmeister, “Towards Real-Time People Recognition on Aerial Imagery using Convolutional Neural Networks,” 2016 IEEE 19th Int. Symp. on Real-Time Distributed Computing, 2016. W. Zhou, H. Li, Y. Lu, and Q. Tian, “Principal Visual Word Discovery for Automatic License Plate Detection,” IEEE Trans. on Image Processing, Vol.21, No.9, pp. 4269-4279, 2012. A. Sasi, S. Sharma, and A. N. Cheeran, “Automatic Car Number Plate Recognition,” Int. Conf. on Innovations in Information, Embedded and Communication Systems (ICIIECS), 2017. J. P. D. Dalida, A.-J. N. Galiza, A. G. O. Godoy, M. Q. Nakaegawa, J. L. M. Vallester, and A. R. dela Cruz, “Development of intelligent transportation system for Philippine license plate recognition,” 2016 IEEE Region 10 Conf. (TENCON), 2016. J. C. McCall and M. M. Trivedi, “Video-based lane estimation and tracking for driver assistance: survey, system, and evaluation,” IEEE Trans. on Intelligent Transportation Systems, Vol.7, No.1, pp. 20-37, 2006. R. Gopalan, T. Hong, M. Shneier, and R. Chellappa, “A learning approach towards detection and tracking of lane markings,” IEEE Trans. on Intelligent Transporation Systems, Vol.13, No.3, pp. 1088-1098, 2012. E. A. Roxas, R. R. P. Vicerra, A. H. Fernando, E. P. Dadios, and A. A. Bandala, “Road Lane Reconstruction Using Vision – Based Macro Block Spatial Predictions,” 2017 IEEE Region 10 Conf. (TENCON), 2017. A. Ambardekar, M. Nicolescu, G. Bebis, and M. Nicolescu, “Vehicle classification framework: a comparative study,” EURASIP J. on Image and Video Processing, pp. 1-13, 2014. T. Moranduzzo and F. Melgani, “A SIFT-SVM Method for Detecting Cars in UAV Images,” 2012 IEEE Int. Geoscience and Remote Sensing Symp., 2012. M. S. R. Sajib and S. M. Tareeq, “A Feature Based Method for Real Time Vehicle Detection and Classification From On-Road Videos,” 20th Int. Conf. of Computer and Information Technology (ICCIT), 2017. C. Zhang, X. Chen, and W. Chen, “A PCA-based vehicle classification framework,” Int. Conf. on Data Engineering Workshops, 2006. H. Kim, Y. Lee, T. Woo, and H. Kim, “Integration of vehicle and lane detection for forward collision warning system,” 2016 IEEE 6th Int. Conf. on Consumer Electronics (ICCE), 2016. S. Gupte, O. Masoud, R. K. F. Martin, and N. P. Papanikolopoulos, “Detection and classification of vehicles,” IEEE Trans. on Intelligent Transportation Systems, Vol.3, No.1, pp. 37-47, 2002. R. Avery, Y. Wang, and G. S. Rutherford, “Length-based vehicle classification using images from uncalibrated cameras,” Proc. 7th Int. IEEE Conf. on Intelligent Transportation Systems, 2004. S. Tuermer, J. Leitloff, P. Reinartz, and U. Stilla, “Automatic Vehicle Detection in Aerial Image Sequences of Urban Areas Using 3D HOG Features,” Int. Archives of Photogrammetry, Remote Sensing and Spatial Information Sciences (IAPRS), Vol.38, No.3B, pp. 50-54, 2010. J. Arróspide, L. Salgado, and M. Nieto, “Video analysis-based vehicle detection and tracking using an MCMC sampling framework,” EURASIP J. on Advances in Signal Processing, pp. 1-20, 2012. Z. Changjun and C. Yuzong, “The Research of Vehicle Classification Using SVM and KNN in a ramp,” Int. Forum on Computer Science-Technology and Applications, 2009. P.-A. Raktrakulthum, “Vehicle Classification in Congested Traffic Based on 3D Point Cloud using SVM and KNN,” 9th Int. Conf. on Information Technology and Electrical Engineering (ICITEE), 2017. X. Cao, C. Wu, P. Yan, and X. Li, “Linear SVM Classification using Boosting HOG Features for Vehicle Detection in Low-Altitude Airborne Videos,” 18th IEEE Int. Conf. on Image Processing, 2011. A. Wang, Y. Zhao, Y. Hou, and Y. Li, “A novel construction of SVM Compound Kernel Function,” 2010 Int. Conf. on Logistics Systems and Intelligent Management, 2010. C. J. C. Burges, “A Tutorial on Support Vector Machines for Pattern Recognition,” Data Mining and Knowledge Discovery, Vol.2, No.2, pp. 121-167, 1998. E. A. Roxas, R. R. P. Vicerra, E. P. Dadios, and A. A. Bandala, “Vehicle classification method using compound kernel functions,” 2018 IEEE Int. Conf. on Applied System Invention (ICASI), 2018.